In every society, some people hold more wealth than other people. Every society, in other words, has a rich. But not every society’s rich has enough wealth to really dominate. Not every society’s rich has enough wealth — and power — to rig the rules at the expense of average people. In the United States today, our rich certainly does have enough. Researchers from the IRS have just delivered the latest evidence. < These researchers last week released the latest annual breakdown on America’s 400 highest reported incomes. In 2014, their new IRS report notes, our top 400 collected incomes that individually averaged an astounding $317.8 million. Want a little more human perspective on that total? If you suddenly found yourself with a nice little job that paid $10,000 per month, you would have to work over 2,600 years at that job to make what America’s top 400 averaged in just 2014 alone. We can get an equally telling perspective by comparing today’s rich to yesterday’s. The IRS statistical series on top 400 incomes goes back a bit over two decades. In 1992, the first year in the series, the top 400 averaged a mere $46.8 million. 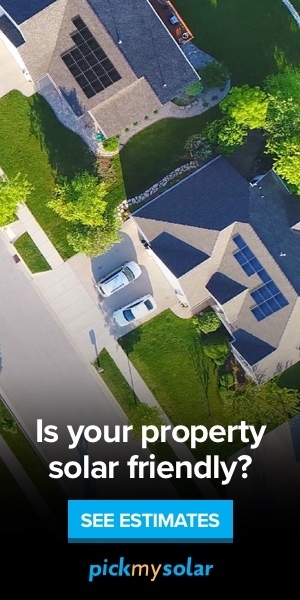 That’s less, after adjusting for inflation, than a quarter of what 2014’s top 400 took in. Even more jaw-dropping stats start turning up when we go back further in time. The IRS doesn’t supply top-400 numbers for before 1992, but we can recreate from IRS historical studies some close-to-400 top cohorts. For 1955, for instance, we can tease out totals for the nation’s top 427 reported incomes. 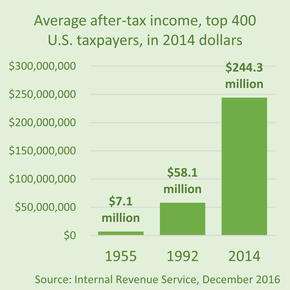 Back then, in the middle of the Eisenhower years, the wealthy taxpayers in this near top 400 averaged less than $1.7 million each, about $14.6 million in 2014 dollars. So America’s top 400 in 2014 made over four times the real income of 1992’s top 400 and nearly 22 times what 1955’s richest pulled down. That’s all before taxes. After taxes, the contrast becomes even more striking. In 2014, the new IRS data indicate, the wealthy residing in the top 400 paid 23.13 percent of their incomes in federal income tax. In 1955, the most affluent 400 paid federal taxes at well over twice that rate, 51.22 percent. America’s top 400 in 2014 made, after taxes, over 34 times what 1955’s richest pulled down. After taxes, and after taking inflation into account, 2014’s top 400 had over 34 times more dollars in their pockets than their fellow affluents of 1955. As a group, 2014’s top 400 had almost $98 billion sloshing around in their pockets after paying their taxes. The top-400 gang in 1955 had less than $3 billion. What do today’s super rich do with all their extra billions? They expend a major chunk of that excess on distorting the democratic process — to their own personal benefit. Some of contemporary super rich — like the billionaire Koch brothers — invest heavily in obscure “down-ballot” races and help their preferred candidates overwhelm any opposition. Others like Amazon’s Jeff Bezos and gaming magnate Sheldon Adelson buy their own high-profile daily newspapers. Still others like Donald Trump leverage their billions into winning their own elective office. How much difference does all this rich people political involvement make for everyday Americans? Three of the world’s top inequality analysts — economists Thomas Piketty, Emmanuel Saez, and Gabriel Zucman — have just supplied an answer. They’ve released a new report that tracks where the rewards from the growing American economy are going. Since the 1970s, the trio notes, the size of the American economy has more than doubled. That doubling has been quite good news for the deep pockets of America’s top 1 percent. Their share of the nation’s income has itself doubled, from 10.7 percent in 1980 to 20.2 percent in 2014. Incomes for the bottom 50 percent of U.S. earners have barely budged up at all. Average top 1 percent incomes, in the meantime, have much more than doubled after inflation, from $428,000 in 1980 to $1.3 million in 2014. Incomes for the bottom 50 percent of U.S. earners, by contrast, have barely budged up at all. This bottom 50 percent averaged $16,000 in 1980 — a figure that includes the value of employer-provided fringe benefits and government supports like food stamps — and just $16,200 in 2014. The cascading incomes at America’s summit, in short, have hardly provided any lift at all to the Americans whose economic well-being most needs lifting. Would everyday Americans be doing any better today if our rich were not getting spectacularly richer? The history of the years immediately after World War II suggests an answer. In the three decades right after the war — the era that saw America’s richest make only a fraction of what our richest make today — the real incomes of the bottom 90 percent of Americans, the new Piketty-Saez-Zucman data point out, on average doubled.